When you hear the word “art,” you may automatically think of paintings and sculptures. In reality, art is a much more expansive term that can include architecture, applied arts, decorative arts, prints, photography, pottery, and many other works that can be appreciated mainly for their beauty or emotional pull. At Aardvark Antiques, we are dedicated to bringing you quality pieces that you can’t find anywhere else. Fine art and decorative arts are a big part of our offerings. When browsing our art gallery, you will come across a variety of terms that describe different styles of art. Here’s a quick look at some of these terms and their meanings. Art Nouveau (är(t) no͞o `vō) simply is a French term, which simply means, “new art”. This style of art can be applied to interior decorating, graphic art, furniture, architecture, jewelry, and fine arts. Art Nouveau was at its height of popularity at the end of the 1800’s and the beginning of the 1900’s. The characteristics of this style of art are detailed linear designs and flowing curves based on natural forms. 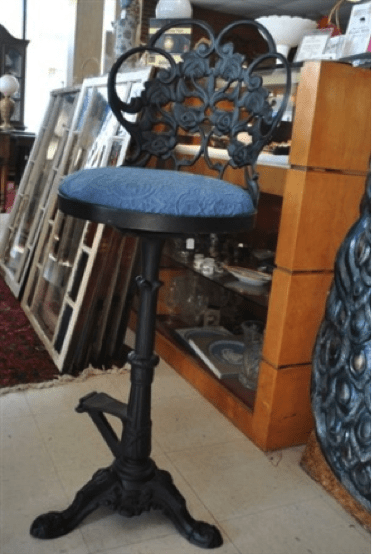 An example of Art Nouveau at Aardvark Antiques is this Antique Art Nouveau Bar Stool. This exceptional stool would work well as a decorative piece as well as a useable piece in any home. Tons of character with light wear from years of loving usage. A beautiful piece as is – has been reupholstered. Measures 44″H. 30″ Seat H. 16″ Dia. seat. Bottom base width of 17″. Very good, sturdy antique condition. Circa 1920. Click here for more pictures and information. Art Deco is a visual art design that originated in France and war popular in the 1930’s through the 1940’s. This style of art, most commonly seen in architecture and household objects, is characterized by strong geometrical shapes and vivid colors. 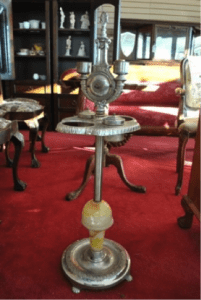 A great example of Art Nouveau at Aardvark Antiques right now is this Ashtray lamp. Circa 1930s. Includes the two original tobacco jars with lids. Orange, cream, and yellow swirled agate slag glass top the base of this cool piece. We have not had another like this in over 16 years in business! Metal has some signs of ageing but can be easily cleaned up. Measures 12″W x 36″H. Click here for more pictures and information. Contemporary art is exactly what it would seem to be: art that is produced at present time or more pointedly, “in our lifetime”. This fabulous piece of contemporary art was created by James Holden and entitled Ascension. This exceptionally striking work is an immediate conversation piece every time it is viewed, as well as a neutral toned decoration for your wall that can complement a variety of decor styles. 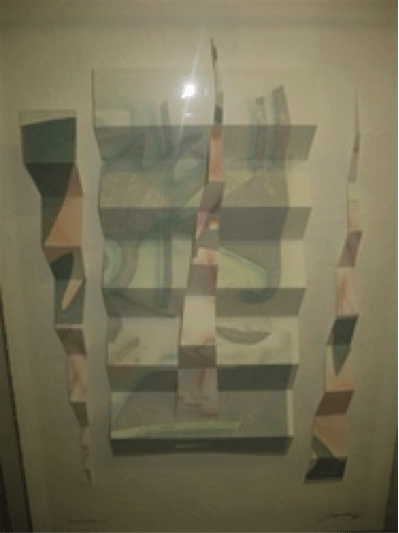 This is a super affordable piece of fine art that will hold its value and grow in value. We hope you enjoy it as much as we have as it has hung in our gallery. It measures overall 4.5″D x 27″W x 41″H. Click here for more pictures and information. Folk art by definition is a rustic offering generated by native people or tradesmen and utilizing such natural mediums as wood, cloth, paper, clay, etc. A great piece at Aardvark Antiques is this unique vintage mirror, hand made from wood and painted in a folk art style with carved fruit and flower design. 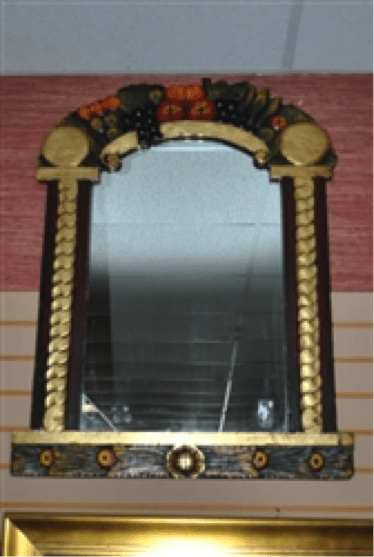 The size of this mirror is 28″ w x 36″ h and the mirror itself is 16.5″ x 26″ h. Click here for more pictures and information.